Puppies are coming, Puppies are coming! If you are interested in adopting one of our babies, please email us AND fill out our puppy application. 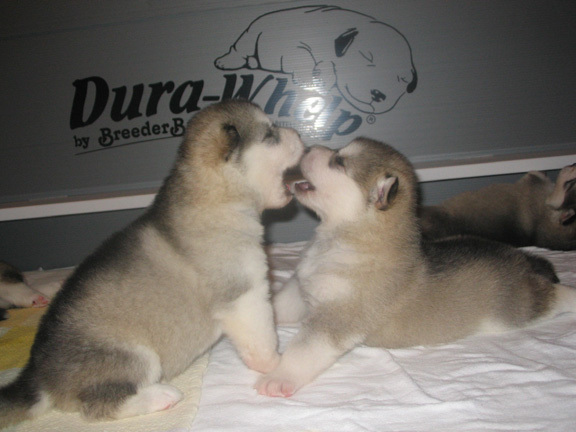 There aren't many things cuter than a Malamute puppy! Puppies don't stay puppies for long, however, so make sure you consider the 80-90 lb dog it will grow to be! If you are looking to add a Malamute to your family, please spend some time researching the breed to ensure it fits your family and lifestyle. They are smart, sometimes stubborn and definitely not the right breed for everyone! Talk to breeders and owners to see if this dog, at full maturity, is what you and your family are looking for in a dog. If your unable to spend time with your dog or can't commit to socializing, training and getting plenty of exercise, a Malamute is not for you. It's easy to fall in love with the fluffy fur-ball puppy, but a dog is a 10-15 year commitment. PLEASE make sure you are ready for that. If the puppy stage is more than you want to deal with, breeders or breed rescue organization may have quality adult dogs available. Many dogs wind up in rescue due to major life changes in families, not necessarily for behavioral problems. Please consider whether an adult dog may be right for you. See the Info page for links to Rescue organizations or contact us for more info.